/Driveway Alarms / Dakota Alert / Driveway Alarms / Mier / How to use multiple wireless chimes with your DA500CP. Many customers are looking for the reliability of a hardwired driveway alarm system, but also the convenience of wireless chimes throughout your home. One way of doing that is to combine the DA500 Driveway Alarm with the UT-2500 wireless transmitter. Customers can then place as many of the Dakota Alert DCR-2500 driveway chimes throughout their home as they like. This simple diagram below shows how to connect the UT-2500 to the DA500CP. 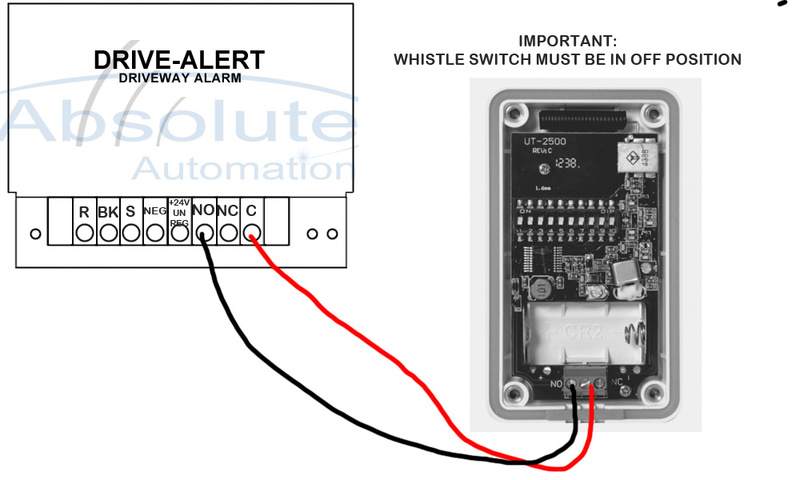 IMPORTANT: In this configuration the whistle switch on the DA500CP must be OFF. How to wire your DA500 Control Panel to the Universal Transmitter. Can the MIER DA-066 transmitter trigger multiple wireless chimes? I’m looking at your PRUT2500 system and I’m wondering if a door sensor (not motion sensor) could be connected with this system?